Mark Mallen, local Spinning instructor, is planning to ride for an amazing 12 hours on Thursday 5 September to raise funds for local charity, the Torbay Holiday Helpers Network (THHN). For those of you wondering what exactly Spinning is, no it doesn’t have anything to do with wool. Spinning classes are an increasingly popular way to get fit and involve people on rows of exercise bikes lined up in health clubs and fitness centres where everyone then rides together through various phases each class. Mark took up competitive cycling over 40 years ago, when he was just 13, and is always looking for innovative challenges. If he can then turn them into ways to raise money for some great causes he’s even happier. So, his latest idea is to ride for 12 hours on his road bike astride a set of training rollers, with a five minute break each hour, making the whole event an amazing 13 hours. 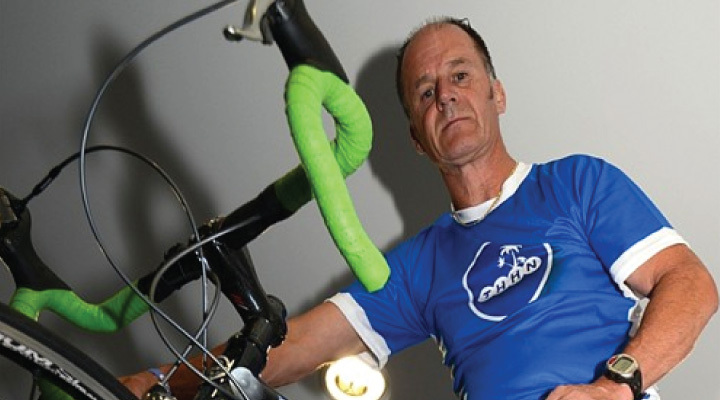 The plan is to set up outside the Winners 2000 gym in Torquay with his bike on rollers and 2 spinning bikes along side. Both spinning bikes are for various other people who will hopefully come along and keep him company for a bit as he pedals. Using bikes on rollers makes the whole challenge significantly more tricky. It really is like cycling normally and needs constant attention and balance or there will be a nasty fall. In terms of fundraising, there will be collection buckets around as the event is underway but there’s also a competition for people to make guesses about how Mark’s day will go. How many miles will he cover? How many calories will he burn? What’s the fastest he’ll go during the day? People will be asked to donate £2 per guess or £5 if they want a go at all three. If you’d like to join in, support Mark or see how he’s doing, pop along to the gym, say hello on the day and have a guess at the answers to his questions. Photography courtesy of Dougie Worthington – Peacock Dreams Photography – official photgrapher to THHN.